Formation of the cavern began about 25 million years ago. It now soars to the height of a 12-story building and stretches the length of a football field. It is the natural home to a colony of sea lions and a diverse array of other marine life and shore creatures. Care is taken not to disturb the natural habitat of the wild animals that dwell here. Stellar sea lions gather in this natural amphitheater, usually during fall and winter. In the spring and summer, they breed and have their young on rock ledges just outside the cave. This place is very special, it is their home. Sea Lion Caves is located 11 miles north of Florence, Oregon, on U.S. Highway 101, about midpoint on the 400 mile Oregon coast milepost 179.1. In this area, Highway 101 follows a steep and wild sea cape 300 feet above sea level and provides access to the gift shop and office headquarters building through which the cave is reached. The Cave system is at sea level and the ocean continually washes into the main cavern. This room has a floor area of about two acres and a vaulted rock dome about 125 feet high. Southward from the main chamber a low passage runs 1,000 feet to a sea level opening. This corridor is flooded at high tide and free of water at low tide. The western entrance is a short, but high passage flooded at high tide and fee of water at low tide. From the north, a third entrance opens into the main cave, about fifty feet above the ocean. This entrance serves as an elevated observation area from which one may view the entire underground cave system and its wildlife. Lichens, algae, and mineral stains paint the cavern walls with greens, pinks, purples, tans, and reds, forming on the rough surfaces such easily distinguishable figures as Lincoln's Head, the Indian Maiden, and Goddess of Liberty. The sea level portion of this cave and the sea cliff rocks just outside the cave have become, over the centuries, the only known mainland rookery (breeding area) and hauling area (wintering home) of the Stellar sea lion, and to lesser extent, the California sea lion. The high vault is also a natural resting place for fascinating sea birds. Sea Lion Caves is the largest sea grotto in America - comparable both in size and coloration to the famed Blue Grotto of Capri in the Mediterranean - and it is Nature's entertaining and educational exhibit of a wide variety of marine life. Originally the cave was entered by a trail and stairs. The quarter mile of steep trail and the 250 stairs were often a formidable climb for many visitors and an impossibility for some. The decision to install the elevator was almost public obligation although the construction promised to be an expensive, difficult, and lengthy task. The job was started in April of 1958. A ten by ten, 70 foot drift tunnel was blasted in the cave wall and then an eight by fifteen foot vertical shaft was excavated, ascending 215 feet. The blasting necessary to drive these two intersection shafts was confined to spring months when the sea lions were out of the caves. The engineers and construction workers used every possible precaution to insure that the wildlife would not be disturbed. 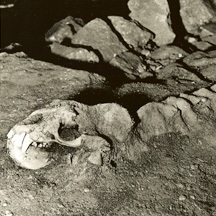 The drift tunnel and elevator shaft could not be finished the first year before the sea lions returned to the caves so the remaining excavation was delayed and finished in the spring 1959. During the fall and winter of 1959, deep foundations were laid, and the shaft and drift tunnel were lined with Gunite, a mixture of sand, cement, and water, applied with compressed air. However, a unique problem was encountered - the entire shaft was subject to water seepage. The water could not be controlled until the Gunite lining was installed, and the lining could not be made stable until the seepage flow was controlled. What seemed to be a classic paradox was finally solved by and intricate system of small catch basins which collected the waster to be carried away in pipes. Finally it was possible to finish the shaft lining and to install the ring beams every thirteen feet upon which the elevator guide rails would be fastened. 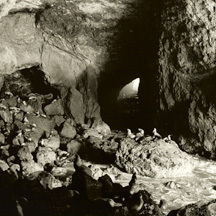 During the fall and winter of 1960-61, the elevator building and the emergency staircase inside the shaft were completed, By June of 1961; the new method of reaching Sea Lion Caves was opened for public use. The elevator has a capacity of twenty-three passengers, a decent of 208 feet, and a travel rate of 250 feet per minute. It will accommodate about 400 people per hour. Many of its parts and fittings were specifically fabricated to resist the corrosion of salt air and moisture, and in the years since its completion the elevator has proved to be almost trouble free. 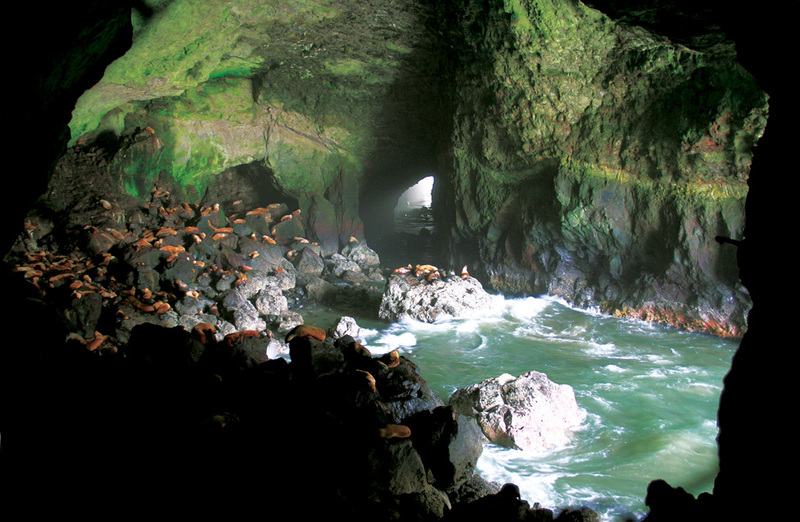 The Sea Lion Caves is America's largest sea cave as identified by the Guiness Book of World Records. It is the year round home of the Stellar Sea Lion. As of 2009, the Sea Lion Caves area is one of the few places along the west coast where the population of the Stellar Sea Lion is increasing. The Cave vicinity is home to several other animals other than Stellar sea lions including bats, pigeon guillemots, cormorants, gulls, orcas, gray whales, humpback whales, harbor seals, California sea lions, bald eagles, mountain lions, black bear, elk, deer, chipmunks, gray squirrels, owls, common murre, tufted puffin, marbled murrelet, black oystercatcher, anklets, sandpiper, dunlin, whimbrel, snowy plover, osprey, killdeer, and numerous ducks and geese. Many seabird species are endemic and found nowhere else, except along the Oregon Coast. 1880 - Sea Lion Caves was discovered by a local seaman, William Cox, who entered the grotto through the western channel in a small boat on a calm day. He reportedly returned to explore the caves a number of times and on one occasion was marooned for several days because of stormy weather and rough ocean. During this time he supposedly sustained himself by shooting a young sea lion and eating the meat of its flippers. 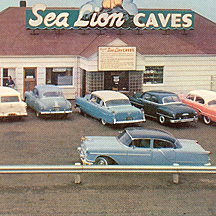 1887 - Regardless of the incident's authenticity, it is established that Captain Cox purchased the land containing the sea lion Caves from the State of Oregon. 1927 - There were no roads in the area that that time. The slopes of the rocky headlands were used for sheep pasture. Access to the caves from the hillside above was not even considered until after the land was acquired by R.E. Clanton in 1927, with the specific intention of opening the Caves as a business. 1930 - When it became probable that U.S. Highway 101 would be completed, Clanton was joined by J.G. Houghton and J.E. Jacobson. These three partners decided to risk all that they owned and could borrow to build a safe access to the cave. 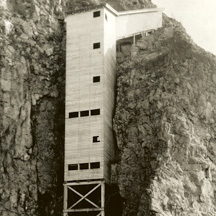 A trail 1500 feet long was excavated by hand into the face of the cliff and at its lower termination a 135 stair-step wooden tower was extended down to the north entrance of the caves. 1932 - Despite the difficulty and danger of the construction, the trail and stairs provided safe access for visitors and Seal Lion Caves was opened to the public by this route in August 1932. 1934 - Traffic was light at first. The highway was only graveled until 1934. Clanton withdrew from the partnership and R.A. Saubert was admitted as a part owner. 1937 - Until 1937 there were just five ferry crossings within 100 miles. 1942 - Word of the amazing phenomenon spread and the number people visiting Sea Lion Caves slowly grew until 1942, when virtually all such travel was halted by World War II. 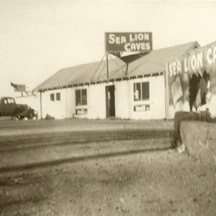 Since 1942 the same three families have since operated Sea Lion Caves as a private responsibility with ownership passing to the partners' sons after World War II. 1958 - Elevator shaft was started in April. 1961 - Since the inception of the Caves in the 1930's word of this unique attraction has been widely spread, The Cave is frequently visited by students of geology, ornithology, marine biology and natural history. The sharpest rise in admissions was experienced in 1961, following the completion of an elevator to carry customers to the cave. 1982 - In Septembers of 1982 The Caves celebrated its 50th year anniversary with the addition of a bronze statue of a family of sea lions sculpted by Ken Scott. 2007 - In September of 2007 The Caves celebrated its 75th year anniversary with the addition of a Caves Totem Pole in front of the building. 2013 - On Saturday, April 27th Sea Lion Caves commemorated the 80th anniversary of the opening of their business with a Founders' Day celebration including appearances by local diginitaries and government representatives. All day long the admission price was the same as it was in 1932, a mere 25 cents.